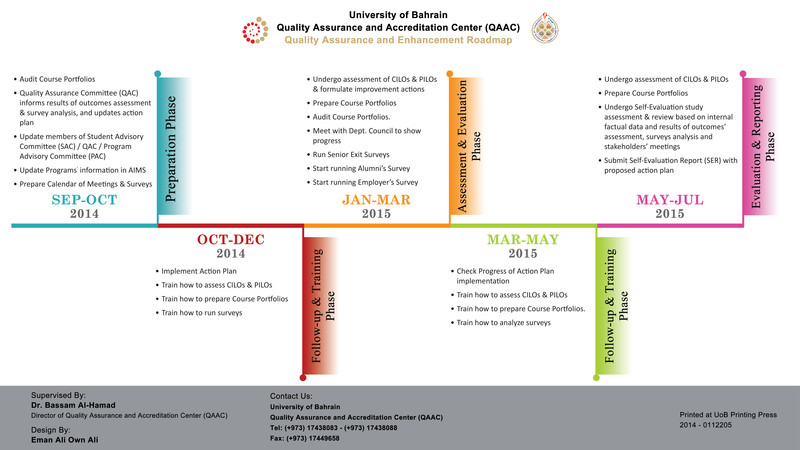 Quality Assurance and Accreditation Center developed the Assessment model roadmap. QAAC follows up with the programs through the College Quality Assurance Director. Quality Assurance and Accreditation Center bases its model of assessment, review and improvement of programs on the Outcomes-Based Assessment Model (IDEAS Handbook). Planning Phase, which includes the new action plans based on the annual program review, update of quality key committees (PAC, SAC, QAC), and update of program’s information in the Assessment Information System AIMS database. Training Phase, which includes training of nominated faculty members for the direct and indirect tools for the assessment of the outcomes. Auditing Phase, which includes the review of the course portfolios, at all levels from program to college to the university by QAAC. Reporting Phase, which includes the Annual (SER Template and Rubrics) to be submitted by all programs. 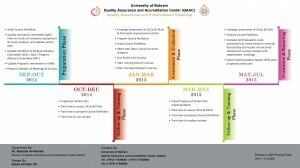 Quality Assurance and Accreditation identified the assessment cycle to be followed by the programs. In addition, QAAC identified all role and responsibility as stated in the QAC Director Manual (QAC Manual).